Extra Large Display, Portable, accurate, and simple-to-use with clinically proven technology. New MWI (Measure While Inflate) technology automatically inflates to the appropriate level (no adjustments required) while reducing measurement time. Gurin products offer clinically proven technology and are used by physicians and hospitals around the world. Compact, portable and simple-to-use, the Gurin Blood Pressure Monitor is an advanced wrist cuff monitor with MWI (Measure While Inflate) technology that automatically inflates to the appropriate level (no adjustments required) while reducing measurement time. This advanced capability adds convenience and ease of use to those with conditions (such as arrhythmia) that lead to fluctuating blood pressure. With ample memory, the Gurin Blood Pressure Monitor stores up to 90 blood pressure readings with date and time Memory recall and automatically classifies each blood pressure reading according to World Health Organization hypertension guidelines. It also calculates average blood pressure readings based on the 3 most recent readings, and detects irregular heart (Arrhythmia) for an improved understanding of your heart’s heath. Based on a wrist cuff design, the Gurin Blood Pressure Monitor is especially helpful for users with above average arm sizes and it stores compactly in a carrying case for travel. 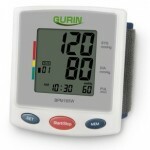 Backed by a 2 year warranty, the Gurin Blood Pressure Monitor ships with 2 AAA batteries included, a carrying case and user manual. Specifications – Large LCD size 36×40mm, 90 groups memory function; Average calculating for the latest 3 times measurement value; Irregular heart beat detection function; blood pressure classification indicator; Date and time function; Automatically inflate; MWI(measuring while inflating technology); Power: 2 AAA size alkaline batteries; Automatic power-off function; Measuring Range: Pressure: 0mmHg~299mmHg; Pulse: 40~180 times/min; Measuring Accuracy: Pressure: ±3mmHg; Pulse: ±5% of reading.